Video clip of the beginning of the Yang Cheng Fu long form - basic level. ​© 2014. All rights reserved. • Tai Chi Tuesday 6 - 7.30 pm: 2-person training, push hands. This training is for people who have learned a Tai Chi solo form either here or elsewhere and wish to advance push hands. • Therapeutic Thursday 6 - 7 pm: floor work and deep relaxation based in cycles of elements - a Chigenics™ class to improve your Tai Chi practice. Sat 4 - 5 pm: Experienced beginners - ongoing training for existing students who are progressing through the Yang Cheng Fu form and ultimate begin learning the Yang Lo Chan long form. • ​New beginners - Contact for details. • Push hands - where is your "center"? Using subtle energy. ﻿﻿﻿﻿Tai Chi is a true, internal martial art﻿﻿﻿﻿ and Ranna teaches it from that point of view. The therapeutic aspects are parallel to the martial aspects. Training intensives are held in the Middletown area of Virginia (USA) and in the Blue Mountains (NSW, Australia). Contact Ranna® Inc for training with Ranna, and details of the lineage of the Yang Cheng Fu Tai Chi and Yang Lo Chan styles of Tai Chi, their philosophy, and history. See also RannaTaiChi.com and TraditionalTaiChi.com (external links). 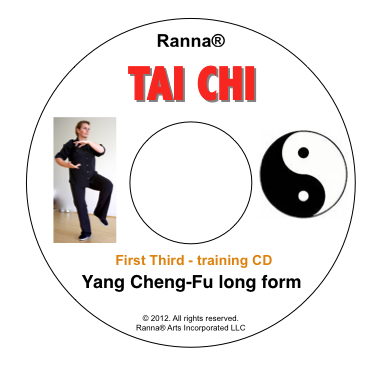 ​Audio CDs are available for students of the Yang Cheng Fu long form are available. Purchase below. 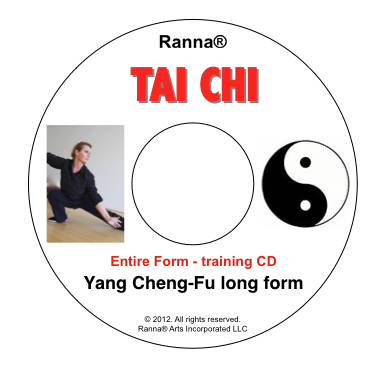 Training DVDs of both the Yang Cheng Fu and Yang Lo Chan long forms are also available to Ranna's students. Contact﻿ RannaInc for DVDs. 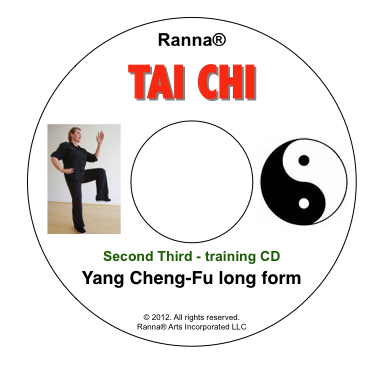 As a supplement to your training with Ranna, these CDs Ranna® talk you through the sequence of movements in each third, real time. There are three CDs, one each for the first two thirds of the form and one for the entire form. These are a valuable tool for students already undertaking Yang Cheng Fu Tai Chi training, to use as a prompt during at-home practice. Click "play" on the sample below to hear a snippet from one of the training CDs. (Video clip about Ranna - click here.) There are no CDs for the Yang Lo Chan form which is an older more intricate form requiring in-person instruction. Related discipline: RoTaiUSA™, Shaolin based pain relief and therapeutic assistance.